I was given this clock at age 5 in 1963. And it worked until it was lost when I moved in 2003. When you wind it the clock plays a nice song.My clock was durable and stood the test of time. it did go a little slower in the last few years. I ws distraught over loosing it. While I gave this toy 5 stars because of my clock. I am disappointed in the new models. They are made out of cheap plastic and the colors are ugly. 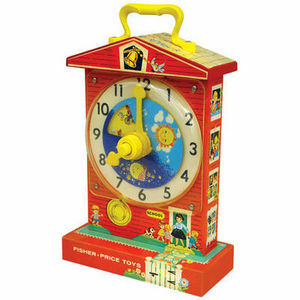 The new Fisher Price musical teaching clocks pale in comparison to the older models. They are still a good teaching tool. SO yes they still get the job done. And I will use this clock to help my 4 year old grandson be prepared for Kindergarten. But the new clocks will never replace my old clock in my heart.I kept it so long I have no idea how it got lost when we v. But over all Fisher Price products have withstood the test of time while other toy companies have faded into the woodwork. This clock is a good way to teach numbers and help a child tell time. I used mine to sing along with the grandfather clock song, but I learned to tell time with it also. I remember moving the hands back and forth trying to guess what time it was. So I still recommend this teaching toy even though it is made out of cheap plastic. I was so happy to see this toy make a comeback. This was one of my favorites as a child. My daughter is still able to play with the one that I had as a child although it is not as pretty as the new one. The new one looks idential to the old one. I love that it is a wind up toy and does not need batteries. Some of the greatest toys are the simplest. Song and the look are just perfect so I am so happy that they did not try to improve on it for the new one. I hope that this will be a toy that my daughter will love for many years and want to save for her children as well. I love the handle and the fact that it is not a huge toy so it take up little room. I just love the look of this toy it is great. I keep thinking about buying an extra and putting it a way for my grandchildren oneday. 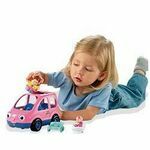 I have also though of buying one for my mom as she always loved this toy too. I hope some of the other classic toys make a come back. We purchased this Fisher Price Musical Teaching Clock for our daughter when she was just a few weeks old. At that early age, you could already tell that she enjoyed it sheerly for the music. Now our daughter is 11 months old and it is still one of her favorite toys. She will get specifically it out of her toybox for us to wind up for her. I love that it is a simple toy. The winding wheel actually winds a real music box (not an electronic one) and it plays real music-box-type music. 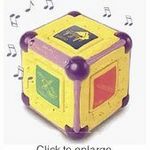 As far as quality goes though, I'm a little disappointed by the ways that Fisher Price cheaped out in the making of this music box. First off, the bulk of the music box is plastic, not wooden, which I guess in this day and age I can understand. However, the stickers that are stuck to the plastic are nothing more than paper with essentially a flat finish on top. This means that when it gets drooled on, the paper doesn't fair well. Also, the paper started peeling up around the edges shortly after we got it. Another disappointment is that the hands of the clock and the sun/moon background to the clock don't always turn - and we can't quite figure out why they stop, or for that matter why they start working again. It is a cute toy, and very nostalgic, but it sure isn't made like the old ones were! I had this when I was a baby and loved it! Of course I had to buy one for my children. The only thing I dont like is that it was too easy for my daughter to rip off the sticker. This is such a great classic toy! This is fisher price musical teaching clock is a great teacher! 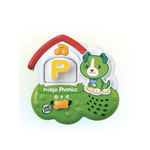 **Fisher-Price Musical Teaching Clock** is a great toy to teach my babies how to tell time!! They are learning the basics and really starting to understand! It barely took any time at all and i definitelyyyyyyyyyyyy recommend this educational toy to all worried parents out there who believe their babies will have a hard time learning how to tell time with a hand clock.